If you’ve kept a vigilant eye on the news, then you might have heard about the new strain of canine influenza. Since 2015, the H3N2 virus has slowly been creeping its way across the United States. This past summer marked the first recorded cases of the disease in Florida. H3N2 isn’t the first type of canine flu to have been recorded. Back in 2004, there was the H3N8 virus which was believed to have originated in Florida from greyhounds. It was speculated that the disease had transferred from horses to dogs. Although it can be found in all 50 states, there has been a vaccine developed to help your pets ward off this disease. The newer strain, H3N2 is believed to have transferred from birds to dogs. Many speculate that it came from dogs being exposed to marketplace fowls carrying avian flu. Although there have been no known cases of H3N2 spreading from dogs to humans, cats have been reported to carry it as well. Signs of H3N2 can start showing up in your dog around 2-3 days after initial exposure. The virus is carried through respiratory secretions and can “survive” on a surface for around 48 hours. With the tendency for dogs to lick or put their mouth on almost anything, it’s no wonder why it spreads so quickly. The mortality rate for canine influenza is pretty low. Around 10% of the cases are fatal. The true danger of this disease is the complications that can arise. If left untreated, your dog can develop complications like pneumonia. 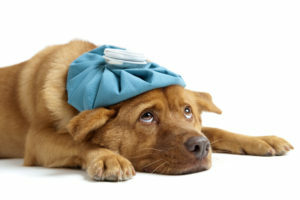 If you suspect that your dog has canine influenza (or any sickness really), take them to the vet ASAP! When given proper treatment, your dog will be back on all four legs in about 3 weeks. You will also want to keep them away from other dogs and cats for about 4 weeks. The last thing your dog would want would be their friends getting sick too. As a dog owner, one of the best things you can do is to get your pet vaccinated. Presently, there are vaccinations available for both strains of canine influenza. At Love My Dog Inc. we take the wellbeing of all canines very seriously. That’s why, starting in 2018, we’re going to require that all dogs staying at our resorts to be vaccinated for H3N2 and H3N8. Visit to our contact page for reserving boarding or enrolling your pet in doggy daycare.